We’d love your help. Let us know what’s wrong with this preview of Dark Child (Covens Rising) by Adina West. Kat discovers that her presence in Paris isn’t such a secret anymore. But if she has to battle the Directorate again, it seems she’ll have much more support this time. Some of it from the m In her dreams, she craved fresh blood. Warm human blood. And her incisors were long, sharp able to bite through a fragile layer of skin with ease. What sort of monster does that make me? To ask other readers questions about Dark Child (Covens Rising), please sign up. Here, Kat is going to have dinner with someone who could get her killed. She's also being given opportunities to be protected by different people. She learns a little more about herself (but not much) and she seems to get a little suspicious as to who to trust. I'll read the next episodes because I'm curious about Kat, and I still don't have enough answers about what she is exactly. I hope we'll find Luc again, because I liked him (I secretly hope she'll accept his offer)... Ben and Yara' story still doesn't really interest me so only have a few chapters of Kat's point of view is a little disappointing and annoying. I was also less confused by this one since I've read the last Episode not too long ago, so that's a good thing. This serial novel series must be read in order. The omnibus of book one is Dark Child (The Awakening): Omnibus Edition. The first episode is Dark Child (The Awakening): Episode 1. The second episode is Dark Child (The Awakening): Episode 2. The third episode is Dark Child (The Awakening): Episode 3. The fourth episode is Dark Child (The Awakening): Episode 4. The fifth episode is Dark Child (The Awakening): Episode 5. The first episode of this book is Dark Child (Covens Rising): Episode 1. This This serial novel series must be read in order. The omnibus of book one is Dark Child (The Awakening): Omnibus Edition. The first episode is Dark Child (The Awakening): Episode 1. The second episode is Dark Child (The Awakening): Episode 2. The third episode is Dark Child (The Awakening): Episode 3. The fourth episode is Dark Child (The Awakening): Episode 4. The fifth episode is Dark Child (The Awakening): Episode 5. The first episode of this book is Dark Child (Covens Rising): Episode 1. This is the second episode of this book. Things are getting more complicated for Ben and Yara. She wants to protect him by making him stay away from her and he wants to protect her by watching out for her. On top of that Ben's guardian is warning him there is trouble brewing in the Directorate sp they have to be ready to cut and run at any time... Where does that leave Ben with his instinctive NEED to protect Yara? And will she even allow him close enough to her her in the first place? Kat is finding it very odd the way men are treating her... Unalil and Tabérin males keep pledging themselves to her and giving her bracelets for her left arm. She has absolutely no idea what that is all about. Not to mention that the whole family of unalil that helped her and gave her sanctuary also pledged themselves to her... Human men pay her special attention and do anything she says. And Jonathan... Well he is like a little lost puppy dog that adores her to pieces... How does she rate this level of attention?! Is she ever going to finish turning? These are just a few of the conundrums palguing her new existence in Paris. This installment was better than all the previous ones combined! I love the new characters and how Kat seems to finally be truly finding her feet. You never know what will happen next or who will become entangled in the convoluted web that is behind the Directorate! I can't wait to see what happens in Dark Child (Covens Rising): Episode 3 so I will be starting it as soon as I publish this!!! Having read The Awakening, I have a better appreciation for what's happening in this series now. We left Kat at the end of Episode 1 hiding from the Big Bad Directorate in Paris, away from her Unalil protectors, and getting along with Dominic, who works for the Directorate. In this one episode she meets with Dominic's employer, and makes a few new friends. Meanwhile, Ben is gearing up to approach Yara about the secret they both share (also, I understand why she's so important now, her father is V Having read The Awakening, I have a better appreciation for what's happening in this series now. We left Kat at the end of Episode 1 hiding from the Big Bad Directorate in Paris, away from her Unalil protectors, and getting along with Dominic, who works for the Directorate. In this one episode she meets with Dominic's employer, and makes a few new friends. Meanwhile, Ben is gearing up to approach Yara about the secret they both share (also, I understand why she's so important now, her father is Very Important). I didn't understand Kat's motivations in this episode. She met with someone who represents the Big Bad and seemed more concerned about how she was under-dressed for the dinner than actually how she was in danger. She also trusted her safety to Dominic, without even letting her Unalil protectors know what was up. Then she met up with the other group of Shape-shifters. Kat is also thinking a lot more about Alek and Amarok, so I think they're about to rear their heads soon. Actually, the way that men treat her is starting to make me uncomfortable - Unalil and Tabérin men are making all these oaths, and they are bound to cause conflicts later. And I really want to know about the bracelets. Ben and Yara have a more predictable plot-line here, and I'm looking forward to seeing where it goes. Their chapters seem to dominate this Episode, and I didn't mind, but I am curious to see how it will link up with Kat's. Ben's chapters have lack the maturity of Kat's, and he is very much ah hormonal teenaged boy who has a major crush on the popular girl, who is also half Tabérin. Again, this episode ends really well and I'm glad I have the next one ready to go! I received a copy of 'Dark Child: Episode 2' for free by the publishers via NetGalley in exchange for an honest review. This is technically the third book in the 'Dark Child' series. 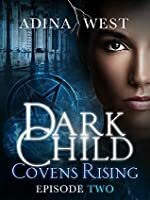 If you're new to the series and want to read these books from the beginning, read 'Dark Child Omnibus' first then the first episode of the 'Dark Child (Covens Rising)' series. Once again we are reunited with the characters which we know and love such as Kat. In this short episode, Kat is being followed and the threat I received a copy of 'Dark Child: Episode 2' for free by the publishers via NetGalley in exchange for an honest review. This is technically the third book in the 'Dark Child' series. If you're new to the series and want to read these books from the beginning, read 'Dark Child Omnibus' first then the first episode of the 'Dark Child (Covens Rising)' series. Once again we are reunited with the characters which we know and love such as Kat. In this short episode, Kat is being followed and the threat to the hybrids is growing. Every hybrid is at risk. Not even Yara is safe and the threat to Ben is growing drastically. Still Ben is adamant he must put Yara before himself, increasing the imminent danger which is posed to both him and his guardian. Yara doesn't want this help, turning him away at every opportunity. Will Yara admit her feelings? Will she allow him to help her? You'll just have to read to find out. I'm really enjoying these wonderful, short little episodes which really seem to add more depth to the characters whom we've already seen in previous books as well as the new characters in the series. The characters have much more depth to them and I think this instalment is my favourite of the series so far! Again Adina was able to bring us back into the story with the second episode with out missing a beat. The events continue to progress as does the characters. It is a smooth and a fast read just like the first episode. The development of the characters are strong and familiar. Yes - we see the same type characters in many YA books, but thankfully Adina didn't make them seem so cookie-cutter in nature. Also it still has be thinking that I'm reading the script for a weekly TV sitcom. Just as I reall Again Adina was able to bring us back into the story with the second episode with out missing a beat. The events continue to progress as does the characters. It is a smooth and a fast read just like the first episode. The development of the characters are strong and familiar. Yes - we see the same type characters in many YA books, but thankfully Adina didn't make them seem so cookie-cutter in nature. Also it still has be thinking that I'm reading the script for a weekly TV sitcom. Just as I really get into the story, I'm left hanging with out the benefit of tuning in next week. I'm not sure how I feel about this being divided into so many episodes. So for now I'm looking for forward to reading the rest of the series. But I do wish that was all in one book. Other than that, once again; I'll give this another 4 stars out 5. Dark Child (The Awakening) novellas came first. Now we're in Dark Child (Covens Rising) novellas. These novella length serialized segments are a bit too short for my taste, but at least I could access the full 5 of them that are currently out. In my opinion, they move far too slowly. I am still sad I did not know there was a previous set of books I could have read first. [Episode 2 of Covens Rising] Kat is in Paris, and more secrets are out. Kat continues to question the role that those around he Dark Child (The Awakening) novellas came first. [Episode 2 of Covens Rising] Kat is in Paris, and more secrets are out. Kat continues to question the role that those around her say she will play. She's dreaming about her Tabérin heritage: make that, her vampire side. She dreams of the fangs she will have, and the bloodlust. There were very little Kat in this book (perhaps 3 very short chapters), and honestly I didn't care for other two characters (Ben and Yara) and their story, which took up pretty much the whole novella. I would much prefer reading about Kat (since we still know very little about her), at the same time I find myself losing interest of this series fast. lovely getting some more information but feel there is a lot of information introduced and again left loose! the nature of serial reading!! desperate to know more and what is happening in this world!!! I read this as a part of the omnibus book. I am so glad I did I would of hated to sit there and wait for the next one. I hardly wanted to put it down. Her first stories were laboriously typed up with two fingers on her parents’ old typewriter. Her d Adina West grew up on a remote property on Australia’s east coast, in country New South Wales. She spent most of her childhood curled up with a book, and her first teenage job was shelving books at the local library, where she was cautioned more than once for reading them instead of putting them away. Now, Adina lives in Sydney’s leafy north-west with her IT guru husband, two children, and a couple of unwelcome possums who really don’t know how to take a hint. Her Dark Child paranormal fantasy series, is available from all good e-book retailers. It’s an eclectic mix of ancient cultures, modern cities, tarot, witchcraft, suspense and romance, and she loves that writing it made watching Vampire Diaries necessary research.